The Bi-Cultural Hebrew Academy Upper School Environmental Club participated in a fascinating learning project over winter break. 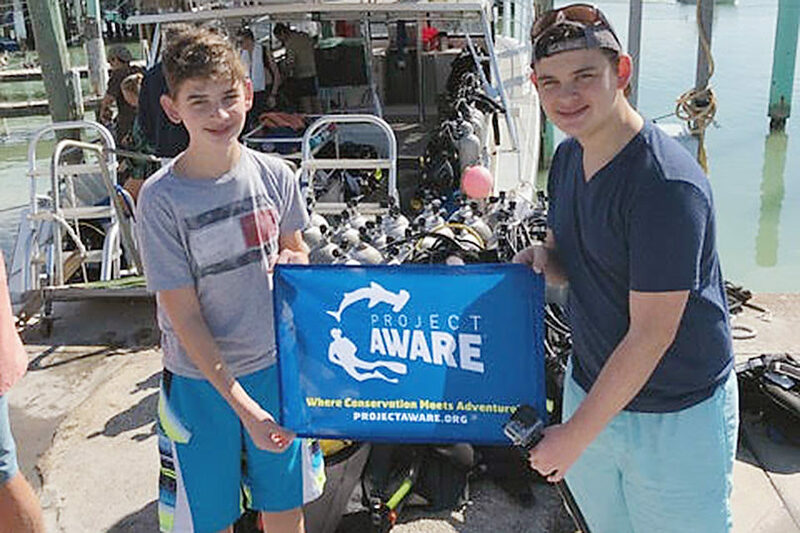 Members of the club traveled down to Key Dives, in Islamorada, Florida to join a group in an environmental cleanup dive. These cleanup dives are run by Key Dives and Project Aware and made possible by the Marine Sanctuary Foundation. Project Aware is an organization founded by PADI (Professional Association of Diving Instructors) to promote environmental conservation. Many scuba divers and marine enthusiasts participate and endorse this organization, which has created the world’s only underwater marine debris cleanup survey and in so doing rallied these ocean lovers to clean up over one million pieces of trash, establish themselves in over 70 countries, and raise awareness throughout the areas they have impacted. As founder and president of the Bi-Cultural Hebrew Academy Upper School Environmental Club, I arranged this event to raise awareness of the dangers to the aquatic system – specifically, biomagnification caused by various kinds of debris left in the ocean. Underwater, club members saw various plastics, ropes, metals, anchors, and unidentified pollutants covering Florida’s beautiful coral reefs. At the end of the day, our group of about 20 scuba divers collected buckets full of trash. Following the cleanup dives, Courtney Benson, Key Dives Marine Conservation coordinator, explained how the types of trash we collected harm local coral reefs. Courtney explained that, as a result of storms and human negligence, thousands of pounds of debris get caught in Floridian reefs; the debris causes several problems for the local ecosystem. Reefs are biodiverse nurseries for endemic fish, so their destruction negatively affects the health and size of local fish populations for many future generations. The destruction of the reefs is a problem not just in the Florida Keys, but globally. After completing their research, the Environmental Club traveled back home with their new knowledge – and the wish to implement some sort of marine conservation environmental cleanup in Fairfield County, which would be the first of its kind in the area. Though an underwater environmental cleanup can only be done during a very short period of the year in the northeast, the club is looking into creating an annual underwater cleanup during the summer. The Bi-Cultural Hebrew Academy Environmental Club is thankful to Key Dives for allowing our team to participate in such an amazing event and we look forward to joining them on an environmental cleanup dive in the near future. Ben Marcus is a resident of Westport and a sophomore at Bi-Cultural Hebrew Academy-Upper School in Stamford. CAP: Ben Marcus (right) and his brother, Josh Marcus, on an environmental cleanup dive in Florida. Ben is a sophomore and Josh is a freshman at Bi-Cultural Hebrew Academy-Upper School in Stamford. It’s a Red Hot Wrap for filmfest!